My family enjoyed having a large garden for many years. We grew potatoes, carrots, onions, green beans, sugar snap peas, zucchinis, eggplants, corn, jalapeños, green peppers, watermelon, and cucumbers in our yard. We had edible landscaping, so strawberries lined the walkway and raspberries lined the lot line. We also had various fruit trees - apple, pear, plum, peach, cherry, and hazelnut. Needless to say, we really enjoyed our wide selection of fresh produce that we had each year. Earlier this year; however, due to circumstances beyond our control, our family had to move. Now, we are in a location where we are not allowed to have a garden in our yard. 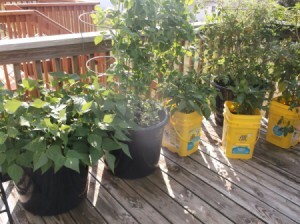 Although we were disappointed, we decided to have our own "potted garden" on our deck. It's not nearly as much as we had before, but it is still nice to have some fresh homegrown produce. We didn't want to spend a considerable amount of money on buying pots, so we decided to reuse empty kitty litter bins. To prepare the kitty litter bins, we simply rinsed them out, removed the lids, and drilled holes in the bottom to allow for drainage. 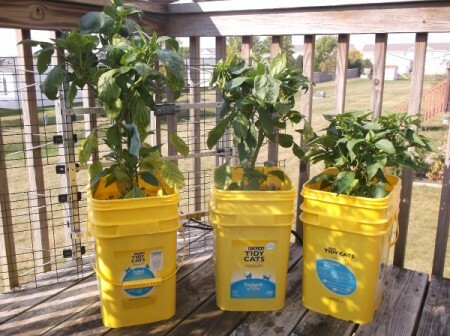 The kitty litter bins have worked well for the jalapeño and green pepper plants that we planted. If you don't have a cat, you could possibly ask around to see if anyone has them that they are simply tossing away. For the tomatoes, green beans, and sugar snap peas, we used large round plastic containers that we picked up inexpensively - they were cheaper than the pots of the same size. Again, we drilled holes in the bottom of them to allow for drainage. We aren't quite use to container gardening (we are still learning), but we have been able to grow (and enjoy) sugar snap peas, green beans, cherry tomatoes, jalapeños, and green peppers. Maybe we will expand next year to grow more. I love your planters. I was reminded of this project that I posted a few years ago. I've been saving the smaller laundry detergent tubs, which remind me of your kitty litter containers. 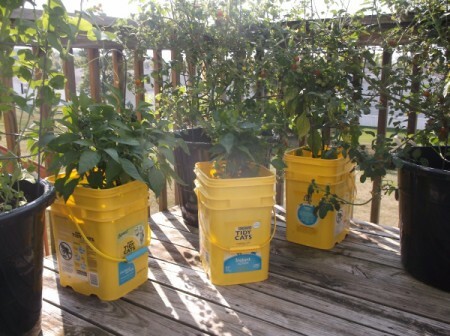 I'm going to make more self-watering containers and maybe make a wooden box to disguise the bucket part. Next year, you might try making one of these self-watering planters. This blue planter has kept my spring basil going all summer long, even through our drought and hot weather. Thank you for letting me know. We have been experimenting with self-watering pots for our strawberries. We are still learning, but we are having fun during the process. Have a wonderful day. Looks like I forgot the link in my last post. I added it to the comment but here it is again. So easy and effective. I'm going to bring my basil in this fall and see how long I can get it to grow inside. Thank you. I will check that out. Always looking for ways to improve. Have a wonderful day.